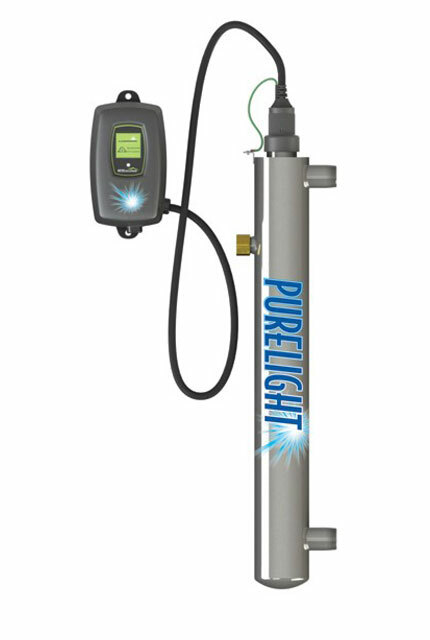 If you get your water from a private or community well, and you suspect your water is not safe, consider a Purelight® UV purifier for pure water and peace of mind. UV purifiers kill bacteria, viruses and other microorganisms without the use of chemicals, and are highly effective. UV purifiers are also recommended for city water, where Chlorine levels are insufficient for proper disinfection. Install unit after water softener and other water treatment equipment. *Flow rate is based on high performance at 30 mJ/cm 2. Maximum water temperature is 104°F (40°C). Minimum water temperature is 36°F (2°C). Maximum pressure is 125 psi. Lamp life is 9,000 hours. 110 volt; 60 hz. The Best UV Purifiers money can buy! High quality, stainless steel systems with unique controller to remind you when lamp replacement is necessary.